Here are some of the projects I have made since I started blogging in Nov 2012 – You can find details about them by browsing back through my blog. Pieced back and mitered corners – a first for me! Joint project with my sister in law – borders are on! Sundresses – “to Tie for” design by Olive Ann. size 3. A Chicken Round Up ! Top stitched around the outside of the checker so you could SEE it!! Helps it to stand out. Below are some of my more recent OLDER projects. I made this quilt for my third grandchild. The hexagons for the main part of the quilt are all made from one fabric, cut into triangles. The outer border on the front and back of the quilt show what the fabric looked like before it was cut. Thanks to my sister-in-law, Carolyn for all her help designing and teaching me! There is a “story” that goes with this quilt which I shall write someday! I did a quilt for a friend as a retirement gift, when she retired from the Air Force. She picked out the fabric, and I picked the design. (I thought she might pick a patriotic fabric, but instead she chose a lovely oriental purple. I chose a “modified” OHIO STAR for the design. It was my second voyage into working with “half-square” triangles. I loved working with my June Tailor “Perfect half and quarter square triangle” ruler. I’ve done another quilt where I used ordinary rulers and marked my center – point to point; but this tool was fabulous. I recently demo’d the tool at a quilt shop where I was taking a class, and the instructor asked the shop owner to order these! Now, I look for patterns using 1/2 square triangles ! I did a couple of baby quilts this fall using them as well. Major Wolff’s “Greek Cross” for his little girl! Wow Mom! These are so pretty! Question about this ruler, that looks wonderful. What size blocks can you make? When I looked on Amazon, it appears that it only goes up to 6 1/2″. Thank you. I use the June Tailor perfect half square / quarter triangle ruler. It only goes to 6 1/2 inches. I used it in a class recently tho; where we were doing 10 1/2 squares, and I just “moved it along the cut” when i reached the limits. I could keep it lined up. I watched it a few times, decided to buy it, and then watched it as a coach my first time thru, and then again when I had not used it in a while. Thank you. Thanks for stopping in to see my page. Hi! Just found your blog on Quilting Gallery. I’m in Sussex County DE too! Your quilts are so pretty. Thanks for stopping in to read my blog. 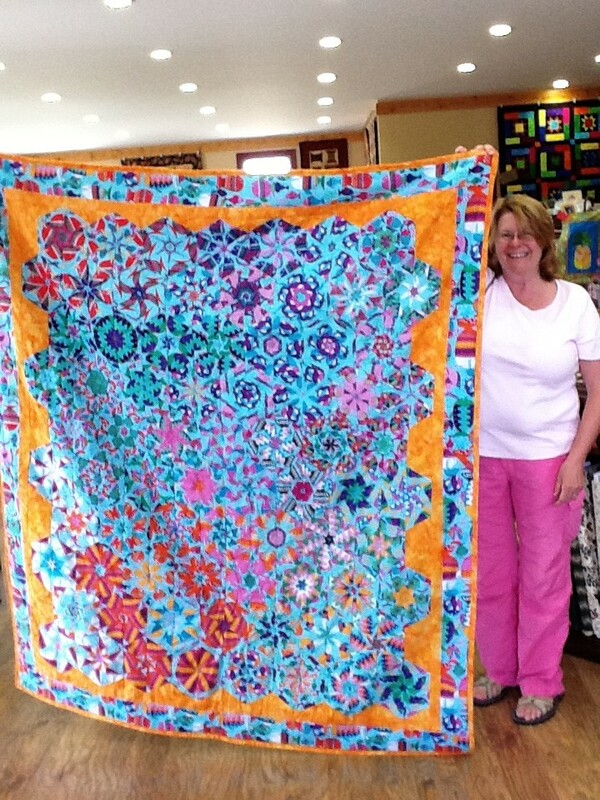 Glad to meet another Sussex County Quilter. My favorite shop in the area is Serendipity in Dagsboro. I have taken two classes there and am looking at the schedule for my next attempt! Thanks for stopping by and checking out my quilts.